D-Tools has been front and center in the realm of system integration software news as of late, with a flood of new updates to its industry-leading System Integrator software platform. While D-Tools will be announcing several more exciting updates before its launch, System Integrator 2015 premiered at the CEDIA Expo in Denver and is expected to launch in Q4 2014. The strides the company has made toward industry standardization have been game changing. One of the more understated yet important updates on this front was D-Tools’ recent addition of Industry Standard Drawing Shapes and Symbols within its System Integrator software, which makes it easy for professionals across all trades to clearly communicate with one another using J-STD-710 Audio, Video, and Control Architectural Symbols standardized by the CEA, CEDIA, and Infocomm, as well as Security Drawing Symbols standardized by the Security Industry Association (SIA) and the International Association of Professional Security Consultants (IAPSC). (D-Tools hinted that it is currently working on finalizing standardized shapes and symbols for Fire and Safety, as well. We’ll report back when those details become available.) 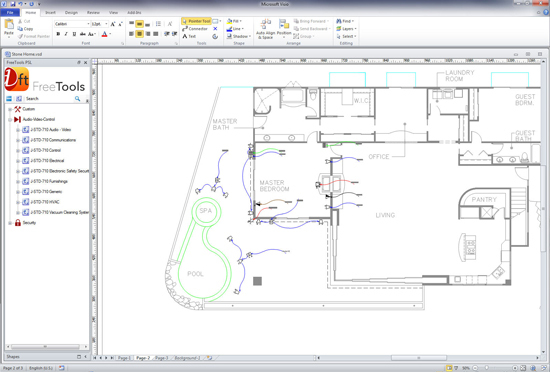 These standardized shapes also allow the integrator to present easily-created, professional looking, and quickly rendered plan views to the end user of the system—whether it’s a commercial business owner or a homeowner—ultimately saving the client on labor costs associated with creating these drawings in the first place. That standardization is what continues to set D-Tools apart across the board, because it allows those using their System Integrator software to quickly and easily get acclimated to the program without having to learn kludgey, proprietary program features with which they are unfamiliar. That commitment to standardization has been carried through to the addition of the Industry Standard Drawing Shapes to the D-Tools platform. To further support this philosophy, D-Tools offers these standardized tools via its FreeTools PSL App, which, like the name implies, is totally free. But it’s more than just the standardization of drawing symbols and programs within D-Tools that makes the platform different. It’s the standardization of processes, as well. The company’s Mobile Quote app, which also recently debuted, does just this by simplifying the quoting process. It not only allows D-Tools users to create quotes on an iPad from anywhere with Wi-Fi (like a client’s home or place of business), it gives them ability to close the deal while still in front of the customer. Of course, this benefits the customer as well, who normally would have to wait several hours if not several days to allow the integrator time to get back to the office, research pricing, and create a quote from scratch—a labor-intensive process, the cost of which is ultimately passed along to the customer. We can’t wait to get a glimpse of SI 2015. Considering the direction D-Tools is going with their innovation, standardization, and simplified workflow processes, we expect that the software will continue to improve the integrator’s bottom line and efficiency, and, ultimately, the lives of their customers.